Here is something sweet for the holidays. It's a low calorie dessert, that will give you the sweet taste, but without the extra pounds. The ginger gives this sweet treat a refreshing taste. I like to make it an hour before serving, so the flavors marinade. This dessert is perfect for gluten-free, dairy-free and weight-watchers. When researching about honey, I found out that honey promotes sleep! It also aids your cough and is considered an antibiotic powerhouse. Ginger is one of my favorites when it comes to getting sick. It has strong anti-inflammatory, antibacterial effects that gives it powerful medical properties. Bonus points to ginger for reducing muscle pain and soreness. Studies done prove that people who consumed 2 grams of ginger everyday for 11 days, had reduced muscle pain from performing elbow exercises. Mince or finely chop fresh ginger, add with honey and water and whisk it up well. 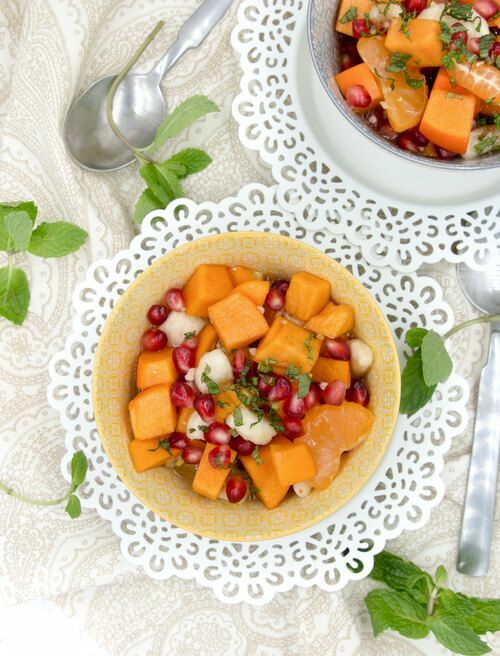 To a bowl add mandarin slices, chopped persimmon, banana slices, and pomegranate seeds. Mix sweet ginger water with fruit. Garnish with fresh chopped mint.